According to a recent study of 500 professional service firms by Hinge Marketing, nearly half of the firms surveyed said that they redesigned their website in the past year. Wow. Even I was stunned by this number – and I’ve spent the past several years talking about how marketing is undergoing a little revolution. I guess that firms have begun to adjust their business development strategies in response to the massive shifts that have occurred in the business landscape since the beginning of the Great Recession. Over 40% of those firms are now updating their sites at least once weekly. New websites are being built for publishing a stream of fresh content that can be promoted in social media. High-growth firms are more focused on virtually every online marketing technique, often by a wide margin. The top four techniques include: blogging, SEO, LinkedIn and Twitter. High-growth firms have increased, or have plans to increase, their marketing budget. 66% of firms plan to increase online spending in the next 12 months. High-growth firms update their websites frequently. High-growth firms are twice as likely to have redesigned their website within the past 12 months. Here’s the big takeaway: the professional service firms that are growing fastest are the ones that are enthusiastically embracing digital marketing techniques. Is anyone surprised? Hinge’s data were compiled from an online survey of 500 professional service firms that averaged 300 employees and $50+ million in yearly revenue. No law firms were included in the study. You can download the complete study for free on Hinge’s website. 11 comments... read them below or add one. Interesting and encouraging. 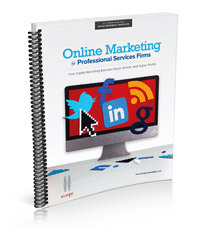 Professional service firms are starting to understand the value of their online presence. Thanks for finding and sharing. This is a treasure trove of great data. I’m so skeptical I have to spend more time digging in to truly believe this. It is almost counter-intuitive. Besides the revelations, I’m also stunned by the 50% new website number. We are certainly seeing interest from professional service firms who realize their visually appealing (sometimes) but moribund sites do not play well in the social-mobile web era. But this is a tsunami of web development which is truly amazing. Perhaps this is heralding in an era where professional service firms are recognizing their website and overall online web presence as an interactive strategic tool and not merely a pretty reference resource. That would be welcome and novel. I believe it is due to a combination of factors. This also goes to show how far behind most professional services firms are when it comes to the new technology. One factor to take into account though is that in 2009 and 2010 the downturn created a lot of pent up demand. The statistics show that in 2011 firms finally ended their spending freezes and had money to build new sites. There is more money to spend in 2011 than 2009 and 2010, but things are still tight. The fact that they are spending money on these things in this economy really underscores that they see real value in an online presence. I agree with others here, this is encouraging! More and more people are going to the web to do business, including finding attorneys. It’s great that law firms get that. They realize that to stay competitive they need to have a great site that meets potential clients’ needs. The reason for this is probably due, for the most part, to the “social shift” online. Based on my daily experiences, I would be surprised if 50% of law firms have done redesigns in the last 12 months. There are still a lot of 1997 law firm websites out there. Interesting stat. I agree with the sentiments. Professional services firms are playing catch up. Thanks to everyone here for checking out the research, and thanks Robert for highlighting some of the findings. I’d like to point out that professional services firms are behind the curve when it comes to online marketing, but that different industries are at different stages. I agree with Gyi that there are still plenty of 1997 law firm websites out there. In the Architecture industry however, folks seem to be more involved in social media and online lead generation. We have recently seen a shift in accounting/finance as well, with more firms optimizing their sites for search engines and becoming involved in LinkedIn groups. It seems natural that law firms will fall into this trend as well. I’m projecting that most of those web 1.0 law websites will transform here shortly, opening up to the concept of content marketing which fits their industry so well.